Qdos Entertainment have delivered a super panto package for MK this year. Plenty of traditional elements present – an abundance of laughs for all ages, bags of slapstick silliness, oodles of audience participation and sing-a-long moments. Wait …there’s more …a huge T-Rex which lives in Sherwood Forest (yeah, go figure but it’s panto so who cares) and a 3D projection sequence which my 8 year old nephew, who had already seen the show, kept telling me was going to scare me. Well, actually some of the projection could be quite scary so parents of very young children and grown up scaredy-cats may well be on their guard here. Hang on … there’s also REAL grown up magic from international illusionist Phil Hitchcock as Merlin. Add in the sumptuous sets and costumes and it’s obvious that this is an expensive production this year! 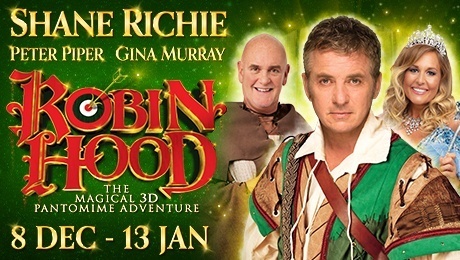 Shane Ritchie, as Robin Hood, is definitely the pulling power; on stage almost the whole time, very funny and kind with cast, grown-ups and children alike and unmistakably loved by the audience. He's such a twit - like a cheeky brother, or perhaps ‘loveable rogue’ is the correct term! Whatever. Obviously completely at home in this genre and is especially super with the children who go up on stage. The interaction between Ritchie and sidekick Peter Piper (Friar Tuck) is hilarious and their infectious giggles really tickled the audience. Add in Michael Quinn (Will Scarlett), Jamie Kenna (Little John) and The Acromaniacs as The Merry Men with their dynamic acrobatic sequence and there’s a sort of cheeky schoolboy gang mentality going on. I’m sure this is why my two young (male) companions were particularly taken with this panto. Proper baddie Sheriff of Nottingham is excellently played by Pete Gallagher who really goads the audience into hissing and booing him at every opportunity. Gina Murray (The Spirit of Sherwood) has a belting voice, Zoe George is sweet, of course, as Maid Marion. Milton Keynes Theatre Orchestra, led by Michael Bradley, keep the show zipping along and our young local future stars from Dancebox Studios must be having the time of their lives. Here we have a top-notch panto. A very inclusive and generous production with an outstandingly enthusiastic and energetic cast who are working their shiny tights off to give the best entertainment to the audience. Very high production values and well worth the ticket money this year in laughs and treats. Robin Hood plays MK Theatre almost daily until Sunday 13 January. Evening performances at either 6pm or 7pm. 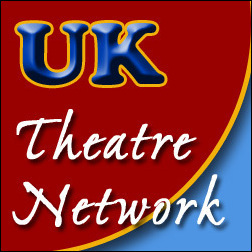 Matinees at 1pm, 2pm or 2.30pm – check the theatre's website for times. 0844 871 7652 (booking fees apply) or visit www.atgtickets.com/miltonkeynes to book.